The front of this NASA educational poster describes the steps the Wrights took that led to the development of the 1902 glider. The back contains web-based experiences to integrate the study of the Wright brothers and aerospace-related topics into classroom activities. This NASA educational poster is printed on both sides and traces the Wright Brothers' story with examples of their experiments and inventions. It also contains an activity for constructing and testing a flying model glider. This two sided NASA educational poster was developed to encourage young women to pursue careers in mathematics, science, engineering, and technology. It also provides information and activities relating to past, present, and future careers in aerospace. 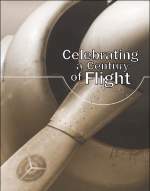 The front of the bookmark features the U.S. Centennial of Flight Commission'sweb site. The back of the bookmark includes several activities that are designed to encourage educators and students to explore thevarious educational components of the web site and to research,plan, and participate in their own centennial of flight activitiesand events.